Pacific Electric car (possibly no. 1120) rolls through the 6th & Los Angeles Street intersection that plays host to a classic Greyhound Bus Station (northeast corner of 6th and Los Angeles) in this undated Robert T. McVay photo. I love this photo. One reason is that the trackage on 6th street was almost unique on the PE. There were only three connections between the PE Western District and the rest of the PE – one was the Santa Monica Air Line, one was where the Redondo via Gardena and the Redondo via Playa Del Rey Lines connected (only to disappear before World War II), and the trackage down 6th Street. There was a junction at Hill Street where cars coming on 6th St could turn onto the major Western District Lines (this was used by box motors in later years). 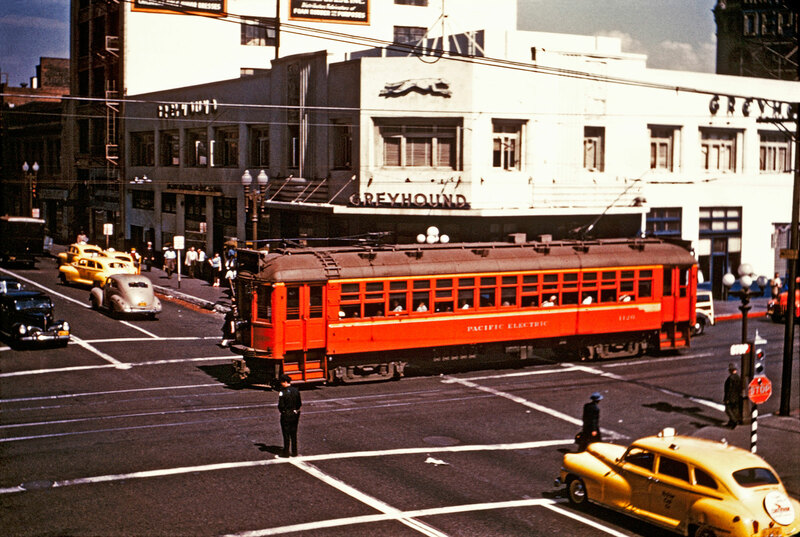 LA’s decision to make 6th St one way eliminated this trackage leaving only the Santa Monica Air Line as the connection betwen districts. I love the bright, colorful paint scheme of the 1100-class car in the photo. Its not as colorful as the paint scheme of the Butterfly Twelves, but its still pleasing to the eyes. During the late ’70’s I rode RTD buses from the mentioned terminal out to Riverside’s Greyhound depot and trips inbound. When I asked why you could not get a Greyhound ticket over the route, I was told RTD had an inherited monopoly (from PE lineage). The strange route ambled out through country roads and through Rub-a-duck. Sheep wandered about in some places. Routings changed frequently as it seemed. Guess RTD did’t really want that monopoly. That was (and may still be) called the “General Southern California Restriction”–When I wanted to go out to San Bernardino from Duarte in 1971 to ride the last UP City of Los Angeles into LA, I took the RTD 68 (440?) to Azusa, and bought a Greyhound ticket to Calimesa, the first stop beyond Redlands. At San Bernardino I got off and walked to the Santa Fe station.